Tiger Muay Thai and MMA Phuket constantly looks to provide it’s guests with the best trainers from around the world. 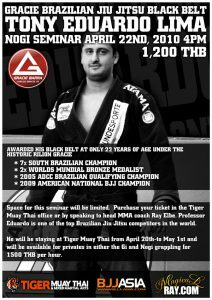 Continuing to push to new heights, Tiger Muay Thai is welcoming back Brazilian Jiu Jitsu phenom Tony Eduardo Lima for a seminar April 22nd. Tony received his black belt at only 22 years of age under the legendary Rillion Gracie. A 7x Southern Brazilian Champion, Professor Eduardo has placed in the Brazilian Jiu Jitsu World Championships twice, and won the prestigious ADCC Qualifying Championships in 2005. The seminar will be April 22nd, at 4pm and the cost is only 1,200THB. To RSVP your space at the seminar speak to one of the MMA instructors (Ray Elbe, WIktor Svennson, or JJ Ambrose) Space will be limited and this seminar is certain to sell out. 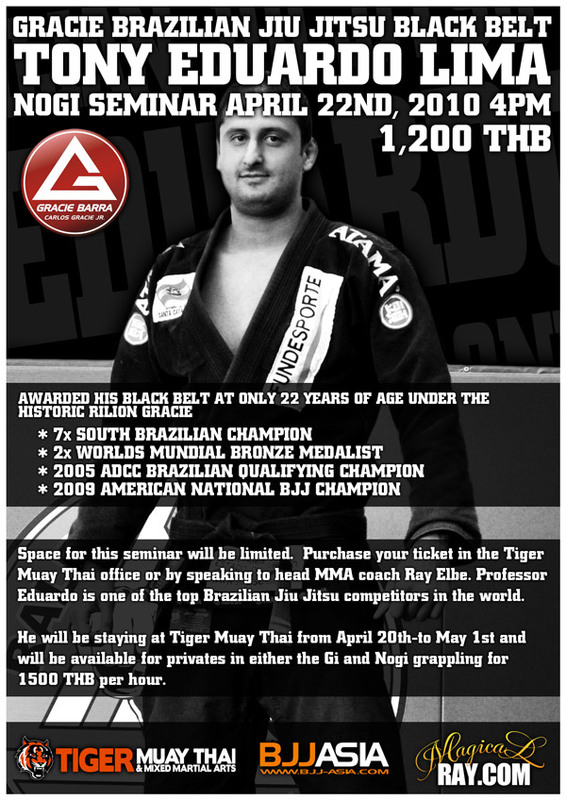 Anyone interested in private training with Professor Eduardo is encouraged to speak to him at the seminar. He will be teaching a limited number of 1 on 1 lessons while he is in Phuket at the rate of 1,500THB per hour.